Unlike others, charities or non profits have remained quite slow when it comes to adopting technology to further their causes, but the few who did have made sensational progress in gaining worldwide support from volunteers and donors and achieving milestones they envisioned. In the context, see how UNICEF (United Nations Children's Fund) is utilizing the Drupal web development framework. UNICEF is undeniably one of the best non profit organizations in the world that has been dedicated to serving humanity since 1946. It reaches out globally to the people in need, particularly, children and women - across all of its 190+ member countries, and is helping the organization that is involved in a variety of social welfare and development, and delivery of emergency services to people affected with natural or human-led disasters including drought, flood, tsunami, earthquake and so on. Written in PHP programming language, Drupal is a comprehensive web development framework that contains an array of resources to help Drupal developers build custom website or CMS as per their needs. 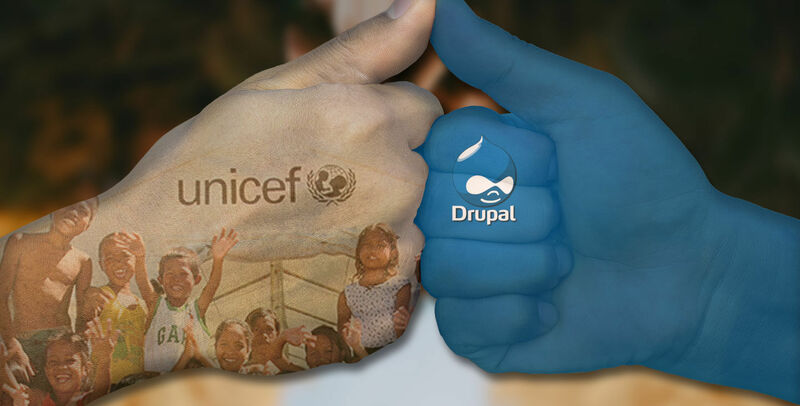 Here is what Drupal developers have made possible for UNICEF (By no mean, we claim here that we have built the site). The communication strategy of the organization with different stakeholders, the target audiences - governments and their functionaries, social development institutions, volunteers and, most important the direct beneficiary - spread across the globe is largely advanced and managed through its Drupal-powered website. The website caters to its audiences in 5 popular world languages, including English, French, Spanish, Arabic and Chinese. Out of 1.25 billion websites (approximately) that are live today, 27% are made out of Drupal website development resources. When we say relevant communication, here is what we mean: reaching out to the right target audience at the right time and at the right platform or device. Fortunately, Drupal makes it happen for UNICEF as it’s the most dynamic content management system the world has ever seen. Adjusting to the resolution and screen-display size of desktop, tablet and smartphone of all sizes, it delivers the best experience to users. Luckily, web developers don’t have to struggle hard to make that a certainty as Drupal comes with responsive modules only. When it comes to the best content management system (CMS), Drupal leaves its counterparts much behind. Drupal has an incredibly easy-to-use yet powerful content editor that enables people managing the UNICEF website to play with the content and keep the audience informed with the latest updates, news and events based on causes, the organization stands for. People can also stay in the know about the progress made through them in alleviating the troubles. The website helps the non profit organization to raise funds for its different causes from the global community. Donors can make the payment safely in their own currency using credit card issues by all popular banks or financial institutions. The payment information submitted for the transaction is protected by Comodo Secure. UNICEF serves people cutting across the disparity based on language, ethnicity, gender, and so on, hence, it needs to customize its campaigns and delivery models very frequently. Thankfully, coping with the varying needs gets easier with Drupal. Being an open source software, there is no dearth of custom modules and themes at drupal.org. Wondering where they come from. Drupal community has got over 1.3 million members over the period of 17 years. You would be surprised to note that of them, 106,650 users are active contributors. So Drupal developers managing the UNICEF website have loads of choice to make when it comes to addressing the changing requirements. Moreover, Drupal facilitates rapid deployment. Even web developers can do customizations after deployment of a Drupal site based on instantaneous feedback and requirements from different quadrants. Indeed, Drupal is a great framework that powers some of the best websites in the world, but to make it work the way you want, you need experienced developers who can customize it for you. However, the coding shall complement the user experience and UI recommended by the designers in the best possible manner.